Although this is not a new feature in Kaseya, I feel as though it is one of the most rarely used. Live Connect on Demand installs a temporary agent on a machine which allows Live Connection to that specific machine, up to a maximum of 12 hours. The best part of this being that as the agent session ends, the agent is automatically uninstalled from the machine. 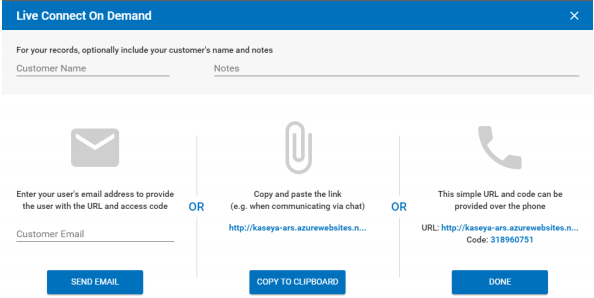 This feature by Kaseya gives flexibility to fix odd problems with user machines without occupying a permanent agent, and still providing that additional earning opportunity. This provides the engineer the capability to provide extensive support remotely without disturbing the end user, ultimately reducing efforts, saving both time and money for all parties. Engineers can remotely troubleshoot the issues without having to be available at the physical location. They can check the utilization of system resources like CPU, RAM and HDD, start/stop processes & services, run commands/scripts, copy/replace files and edit registries to remediate issues on users’ endpoints without interrupting them. •	Use the Agent > Live Connect on Demand > Configuration to configure settings that apply to all temporary agent deployments. Follow the ProVal Tech Blog to get relevant Managed Services content delivered to your Inbox. ©2019 ProVal Technologies, Inc All Rights Reserved.